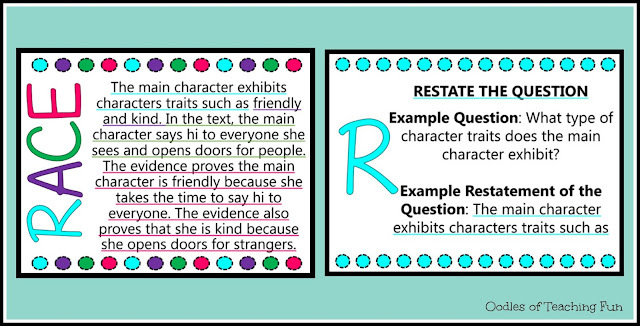 Answering open-ended response questions is an important task and often difficult for students. 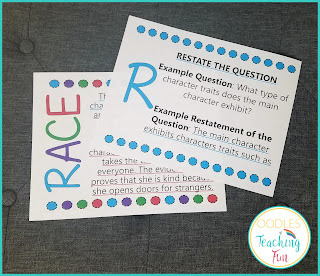 To help my students answer open-ended questions we this use the RACE strategy. First students restate the question, then answer the question, next they find evidence from the text to support their answer, and lastly, they explain how the evidence supports their response. I have seen such significant growth since we began using the RACE strategy. You can download a free copy of the RACE Strategy posters with examples to use in your classroom by clicking here or on the picture. Thank you for stopping by and visiting.